Before we came across to the Orkney Islands, I was really intrigued to find out who the doctors and nurses were on the isles and why they were there. What kind of people were they? Where were they at in their careers? And why were they in Orkney? I’ve since answered that final question for myself – it’s FANTASTIC. Before we left New Zealand I wanted to answer these questions, both in relation to my own career and more importantly to see how they attracted doctors to work in isolated, treeless, windswept conditions. Especially considering the recruitment issues that we face in some rural New Zealand locations. So as I’ve been working alongside the wonderful clinicians out here I’ve tried to have lots of conversations about what has brought people to Orkney, or back to Orkney. Overwhelmingly the response has been that they felt burnt out in their jobs in mainland UK. With the time pressures they were experiencing they were not able to achieve the level of care that they so desperately wanted to give to their patients. They were attracted by the ability to spend more time on the things that had drawn them into medicine in the first place – and of course by the magnificent sense of community that I described in my last blog. 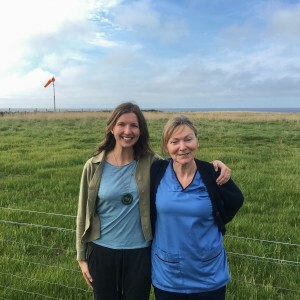 One of the people I had the pleasure of meeting along the way was an Advanced Nurse Practitioner called Bernie, on the isle of North Ronaldsay. North Ron, as it is affectionately known, is the farthest isle from the mainland with a population of around 50 people. In ideal weather it takes an air ambulance over two and a half hours to get to North Ron, and up to six and a half if the weather gods aren’t playing ball. I loved my time with Bernie, and I thought you might like to get to know her a bit too. Bernie is a wonderful Irish woman who warmly welcomed us at the airport as we arrived on the island. She and her husband had decided to do something different when their son left for university, having already worked in a number of different countries around the world. Bernie had worked in a large (18,000 patient) GP practice seeing sixty patients a day for eleven and a half years. She described needing a change to preserve her sanity, and for job satisfaction. Bernie felt that with the pressure of ten minute appointments in her previous job it was a matter of ‘see and treat’. This left no time for preventative medicine or health promotion – both of which she holds very dear to her heart. Bernie feels that the best things about her job are the job satisfaction she experiences and the lifestyle and relaxation it affords her. She feels part of the community is able to contribute to island life. Of course with the isolation comes a unique set of challenges. As I mentioned, it can take a long time for help to arrive – and on one occasion neither the Air Ambulance or Coastguard Helicopter could land due to fog and the patient had to be stabilised overnight. There is also an element of social isolation and she explained that she felt the isolation would be very tough if she didn’t have her husband there. I asked Bernie how she thought we might be able to attract more health professionals to remote areas. She feels that “..with the GP shortages, increased workload and patient satisfaction at an all time low at present down south, it should help with recruitment and get more GP trainees interested in working in rural and remote settings”. She felt that if we can show GP trainees what it’s like in remote and rural practice, they may be more likely to want to work in these settings, “GP trainees may never even think about remote rural practice until the see what it involves”. Bernie is just one (fantastic) woman, but her comments echo those of other health professionals I’ve met out here. They’re all a bit older, and they’ve all been ‘burnt’ in their previous jobs. The lifestyle is great out here and it’s a shame that it has frequently taken negative experiences for people to find their way to Orkney. Many of the doctors I have met have grown up children and they have moved to Orkney once their kids had fled the nest. Perhaps we also need to think about what it would take to encourage doctors into rural practice earlier in their careers. What does it take to bring not just one doctor but a young family into a rural community? Thank You Anna and I’m thrilled you both enjoyed your stay on North Ron and I hope it encourages you to think of working in a Rural and Remote setting. Best Wishes in your future career.